Ron Carroll has been a DJ since the mid-80s and has worked with iconic artists from that generation such as Frankie Knuckles, David Morales, Lil Louis and Ron Hardy! Ron is known for his big-hit tracks such as ‘Lucky Star’ with Superfunk, ‘Back Together’ with Hardsoul and ‘Wonderful World’ with Axwell & Bob Sinclar. Ron has been playing worldwide and has produced and remixed tracks for major artists in the music industry today such as Akon, Sean Paul, Rihanna, Steve Edwards and many more. 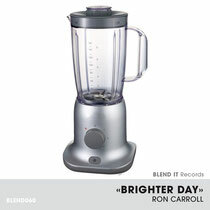 Now Ron returns with his latest single release, ‘Brighter Day’ on Blend it Records, an eight-track release featuring remixes and acapella versions. Check it out below, it’s out January 21.